I loved it. Excellent footage and editing and commentary. I watch before matches to get pumped up. And I slow frame advance to see what the top folks are doing to get so fast. Again a great job done!! And tops DVDs before! It has been really worth to wait!!! Once again, DAA raised the bar with this production. The double DVD is again a display of very good work from you guys. Congratulations. well, if the preview is like the DVD,...it will be a collectors item. Good video of shooters in "think" mode, plus the Open video clips with a good soundtrack make it almost addictive to want to shoot Open (coming from a Standard/L10, and Production/Canada/USPSA production shooter). The 2009 USPSA Open and Production Nationals were held in magnificent Las Vegas Nevada. The large range just outside of town was the perfect setting for this clashing of skill, amongst the best in the sport of Practical Shooting. 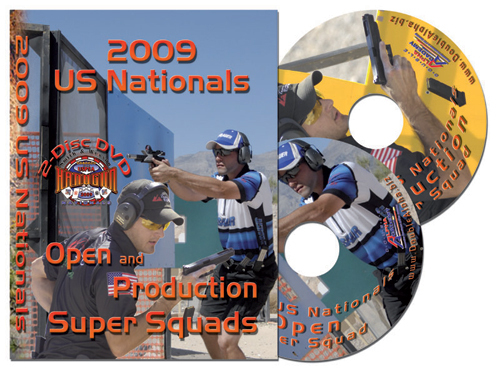 This double-disc DVD set follows the Super-Squad members of the Open and Production Nationals. DVD-1 is dedicated entirely to Open, and DVD-2 shows only Production shooting. Each DVD runs over an hour, and includes the action from all 16 stages of the match. In the Open DVD marvel at the skill and speed of the top contenders, like match winner Max Michel, KC Eusebio and JJ Racaza. Not far behind are Saul Kirsch, Henning Wallgren, veteran Todd Jarrett and Michael Voigt. Chris Tilley is in the mix too, as is Naim Saiti. Each stage includes multiple camera angles, hat-cam action shot by Saul Kirsch, and Saul's stage by stage commentary and analysis. Short interviews are mixed in, talking to the Super-Squad shooters just after they come off the stage, to hear their take on the shooting and the stage tactics. In USPSA Production division, shooters are limited to 10 rounds in the magazines, which makes the action in the Production division even more fascinating to watch. Reloads are required on every stage, and the skill level is astounding to watch! Marvel at the shooting of match winner Robert Vogel, runner up Dave Sevigney, and the other top challengers, the likes of Phil Strader, Matthew Mink, Rob Leatham Angus Hobdell and others. Short interviews are mixed in, talking to the shooters just after they come off the stage, to hear their take on the shooting and the stage tactics.